Comments: For indigo blossoms, butterfly habitat and deer resistance, few plants beat Vitex, an adapted bloomer recently added to the Texas Superstar plant program. 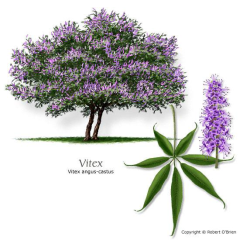 Vitex is also known as Shoal Creek or the Chaste tree. A native of China and India, it naturalized throughout the U.S., as long ago as 1670. For people living in the warmer parts of the South, the 'Lilac Chaste Tree' has been the shrub of choice to mimic the much beloved lilacs that are restricted to cooler regions. It grows best in full sun and in a location that drains well--loves the heat, and is so tough that even the Texas Department of Transportation plants it on highway medians. Vitex is a spectacular butterfly-attracting plant, hummingbirds love it, and it's deer-resistant, although bucks will brush their antlers on its branches if the plant is allowed to grow large.